RARE private large corner lot 3 bedroom home. Relax or entertain in your spacious Arizona room with a private backyard pool and view of golf course! 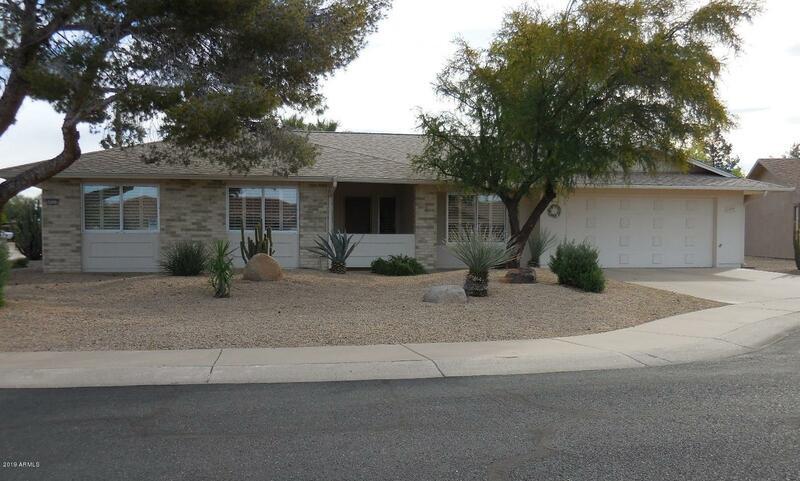 Exceptionally clean and well-maintained Saratoga located in Phase 3 of Sun City. This light and airy home features three bedrooms, all with walk-in closets and ceiling fans. A living room large enough to host friends/family, with sliding door access to 3-season Arizona room; plantation shutters throughout. Master bedroom has sliding door access to backyard. Expanded kitchen with access to Arizona room, finished utility/hobby room leads to garage. Living, dining & bedrooms carpeted, all other floor are tile. Roof replaced 10/2017, A/C 2006, hot water tank 2017, RO & WS 2008, ext. paint 2008. View photos and call/text to schedule a showing!